It should always be admired when an artist attempts to take art out of the gallery and into a thoroughly unusual space. In the case of upcoming installation Babel, it’s being thrust into the middle of Holy Trinity Church in Jesmond. As you may have guessed from its name, Babel’s placement isn’t an arbitrary one. 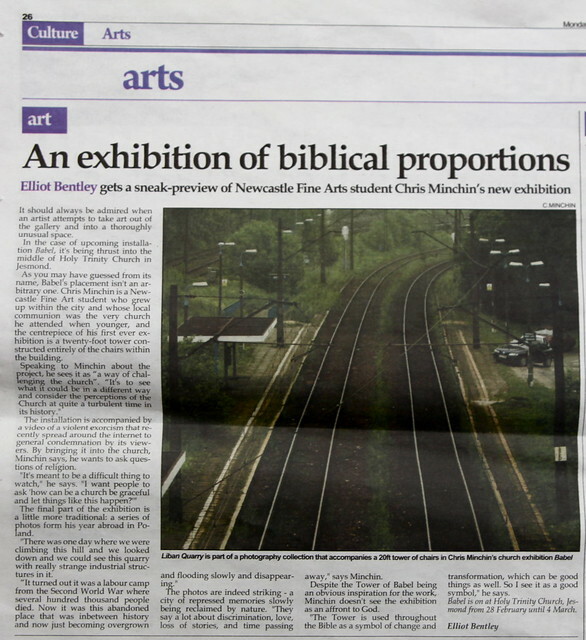 Chris Minchin is a Newcastle Fine Art student who grew up within the city and whose local communion was the very church he attended when younger, and the centrepiece of his first ever exhibition is a twenty-foot tower constructed entirely of the chairs within the building. The final part of the exhibition is a little more traditional: a series of photos form his year abroad in Poland. The photos are indeed striking – a city of repressed memories slowly being reclaimed by nature. “They say a lot about discrimination, love, loss of stories, and time passing away,” says Minchin. Despite the Tower of Babel being an obvious inspiration for the work, Minchin doesn’t see the exhibition as an affront to God. “The Tower is used throughout the Bible as a symbol of change and transformation, which can be good things as well. So I see it as a good symbol,” he says. Babel is on at Holy Trinity Church, Jesmond from 28 February until 4 March. March 7, 2011 | Filed under Press and tagged with 2011, animation, babel, chairs, chris minchin, christopher, do boys pray, front page, holy trinity, manifested glory, press, the courier, tower.